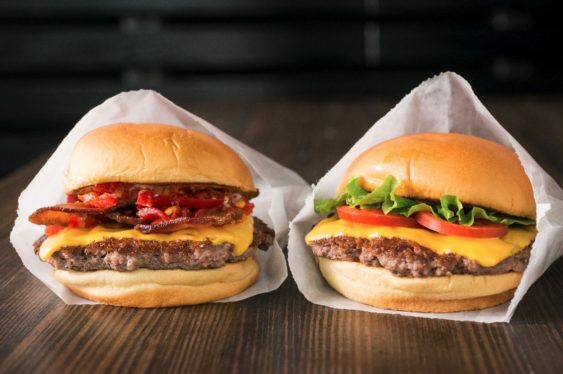 First it was Palo Alto, now Shake Shack will open the doors to its 2nd Bay Area location in Larkspur on Wednesday, March 27th at 11 a.m. The Shack will be located at 1401 Larkspur Landing Circle and will be part of the Marin Country Mart dining and shopping complex. Free Swag on Grand Opening Day – The first 100 people in line when doors open at 11 a.m. will receive a complimentary custom Shake Shack travel bag. The Marin Country Mart Shack will be spinning up frozen custard concretes in collaboration with local purveyors Pie Dreams and Dandelion Chocolate. The menu will also feature the Bay Area-exclusive Golden State Double, a Richards Grassfed Beef double cheddar cheeseburger topped with pickles and smoked garlic aioli. Guests can wash their burgers down with local brews from Fort Point Beer Company, 21st Amendment Brewery, Lagunitas Brewing Company and North Coast Brewing Co. plus Shake Shack’s exclusive Brooklyn Brewery ShackMeister® Ale. Wine lovers can enjoy a glass of Shack RedTM and Shack WhiteTM wine from the Gotham Project as well as a local wine list highlighting producers such as Broc Cellars, Hunt & Harvest, BREA Wine Company and Robert Sinskey Vineyards. Bottles will also be available for purchase. Shake Shack is proud to partner with Cream Co., a curated aggregator connecting certified sustainable and regenerative ranches to the best chefs and restaurants in the Bay Area. With a mission to create a more transparent and diverse supply chain, they emphasize West Coast growers and utilize heritage and heirloom breeds. Cream Co. introduced Shake Shack to one of their longest standing relationships with Richards Grassfed Beef, a multi-generation family ranch located in California’s Eastern Sierra foothills who produce 100% AGA certified grass-fed and finished all-natural beef. Led by Carrie Richards, who is committed to holistic, regenerative farming, supporting the biodiversity of the land, climate, water and more. The cows from Richards Grassfed Beef are born and raised on the ranch, feasting on thousands of acres of lush, green, natural grass and never fed hormones or antibiotics. As part of Shake Shack’s mission to Stand For Something Good®, the Marin Country Mart will donate 5% of sales from the Pie Oh My concrete to La Cocina, a program that gives talented working-class food entrepreneurs, primarily women from immigrant communities and communities of color, opportunities to formalize and grow their businesses. The 2,796 square-foot Shack will feature a multi level deck inspired by Muir Woods as well as ample seating for guests. In keeping with Shake Shack’s commitment to green architecture and eco-friendly construction, the Marin Country Mart Shack’s tabletops will be made by CounterEvolution using reclaimed bowling alley lanes; chairs will be designed by Uhuru using sustainable materials; and booths will be crafted by Staach using lumber certified by the Forest Stewardship Council. 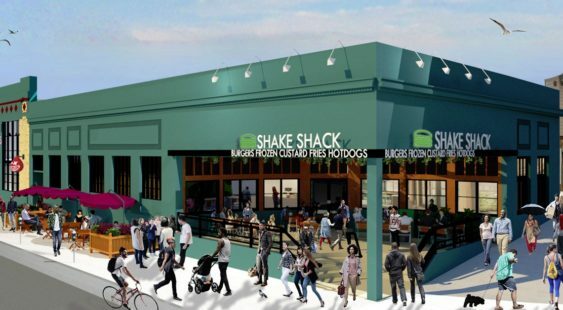 Although nothing is 100% finalized, Shake Shack is eyeing opening up their next Bay Area location in Cow Hollow in San Francisco in the former Real Foods Co. spot on Fillmore and Filbert. Read More.